When we travel in public transportation, we either buy a pass that gives unlimited rides for a day or two, or we specify a destination and buy a ticket. BMTC and other city bus services have a concept of stage to decide ticket price, but passengers who buy ticket still go by origin-destination, not having to worry about stage. Copenhagen and many other European cities follow a concept of Zone system. Whole city and outskirts are classified into close to 100 zones. 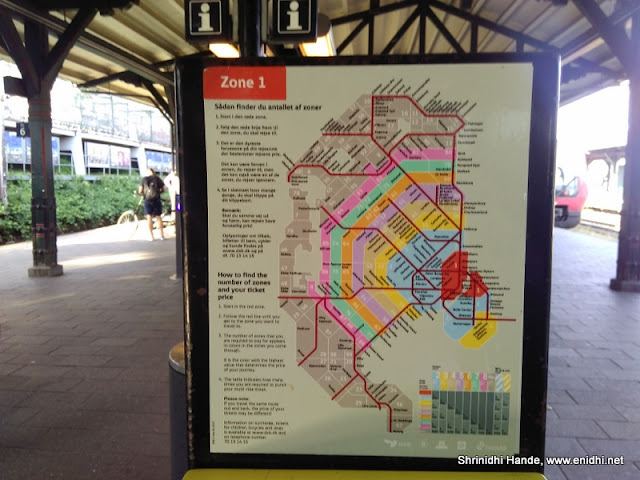 When you travel in Copenhagen, you need to know in which zone you are and how many zones you need to cross to reach your destination and you need to buy tickets for that many zones. All bus stations and train stations have maps of zones or indicate in which zone various stations fall in. Still at times it can get very tricky. Most important zones: First 4 zones (Zone 1,2,3,4) usually cover most of central Copenhagen city, from airport to Copenhagen Central (Kobenhavn H) to Little Mermaid, Opera House, Copenhagen Zoo, most of residential and corporate areas. 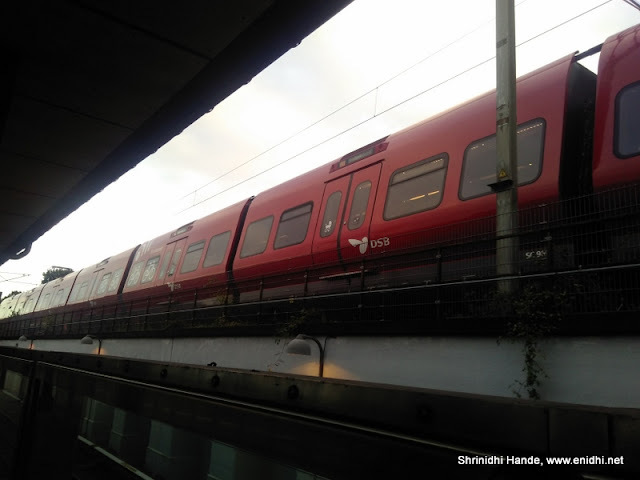 Hence a four zone ticket (costs 48 DKK) usually covers your within city movements, but not valid if you are going to little far away destinations like Bakken, Hillerod, Helsingor, Roskilde etc. Metro connects key parts of central Copenhagen area, running on two lines- One from Airport to Vanlose, other from Vestamager to Vanlose. Max 4 zones. Metro station can be recognized by huge M sign outside- well maintained with elevators, escalators, 7x11 shops and so on. Easy to understand and use. More importantly, extremely quick instead of taking a taxi and getting stuck in traffic. 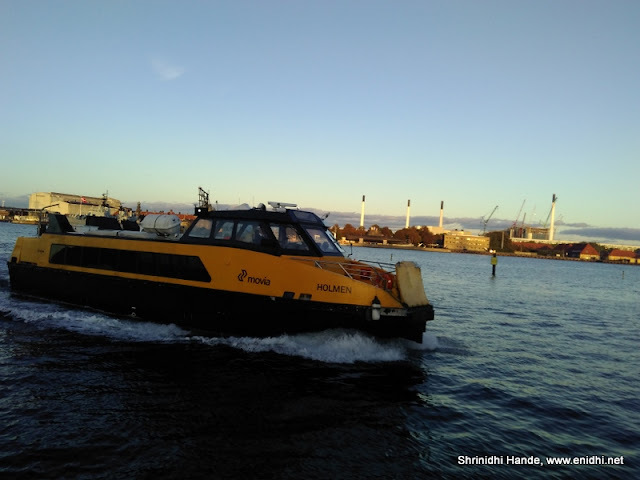 Movia brand covers bus and water transportation- mostly yellow coloured buses and boats. Remembering bus numbers and planning a bus ride is tricky, but each station has details on the zone, route, timing etc, so you can figure out if there is a bus going towards your destination. S trains are suburban trains connecting you to towns on the outskirts of Copenhagen city. Recognized by Red colour and offer free WiFi. DSB inter city trains- often connect Copenhagen with other far away cities of Denmark or even nearby countries like Sweden, Germany. In this train you should be mindful of class. Do not sit in business class compartment with second class ticket. Buying a PASS instead of single journey ticket: A 24 hour all zoner pass costs DKK 130. This will give you unlimited access to all modes of transportation all around Copenhagen for 24 hours from the moment of purchase. All Zone pass is not valid if your destination is outside Denmark-say Malmo) If you have multiple trips, this usually makes lots of sense than buying individual tickets and gives you lots of flexibility to change plans on the fly (for example Kobenhavn Central to Roskilde one way costs 90 DKK, Norreport to Hillerod may cost 80 DKK one way). Alternatively 3 day, 4 zone pass costs 200 DKK, 24 hour 4 zone pass costs 80 DKK- these passes are worth if you have multiple trips to undertake or do not have a well defined plan for the day. Passes and tickets are valid across all modes of transportation- metro, S train, movia bus, movia water bus and also inter-city long distance train, provided you have tickets for the zones you are traveling. In india if you get down from train and board a bus you need to buy fresh ticket. In CPH, same ticket can be used as long as you are in right zone and duration of validity of the ticket. Validating the ticket once doesn’t mean you are all good. For example you may have a 4 zone ticket and you board the train in zone 2. If ticket is checked in next zone you are good. But if you don’t get off within 4 zones and you are checked again say in 8th zone, you may be asked to pay a penalty. Penalty will be as high as 750 DKK. So when in doubt, ask someone to verify you have proper ticket, or you buy a pass or buy ticket by specifying your destination. Most of the ticketing system is fully automated. Getting a human staff to clarify your doubt will be near impossible. There are manual counters in Copenhagen airport and Copenhagen central station- but expect long queue before your turn can come. At other smaller stations if you find some railway staff you can ask them, else you can use official mobile app for relevant information. Besides passengers, bicycles, pets, baby carts etc are all transported in public transportation. Extra tickets are needed for these and there are rules to be followed (like during peak hours bicycles are not allowed in some key stations). As a tourist you may not have to worry about these. I had a monthly pass for 2 zones. But to go to airport which is in zone 4, I had to buy a 2 zone supplement. The ticket would say From Zone 1, for 2 Zones. There was no provision to specify “I need ticket for zone 3 and zone 4”, so I had a fear “what if checking inspector argued that ticket I have is for Zone 1 and 2 and not 3 and 4”. But metro staff confirmed that buying a 2 zone supplement is enough. If you are paying tax in Denmark, money spent on transportation is eligible for exemption. The automatic vending machines are near 100% reliable but not error free. Once I had a situation where machine (in Zone 3, Orestad station) took my money but didn’t dispense the ticket. But it did dispense a credit card receipt for the amount deducted. When such things happen there is no one to complain to, no way to prove that you paid money but didn’t get ticket. (credit card receipt is not a ticket- one can always argue that you gave the ticket to someone else while you are traveling with a receipt). Wasn’t sure if machine will dispense ticket if I tried again and paid once more. I wasn’t sure how to counter if I am checked, but planned to show my card and payment receipt with timestamp, to explain to officers that I bought ticket just few minutes ago with the card (I have both card and receipt with card no on it). But that day no one checked tickets. Reliability of public transportation in Copenhagen has been good. 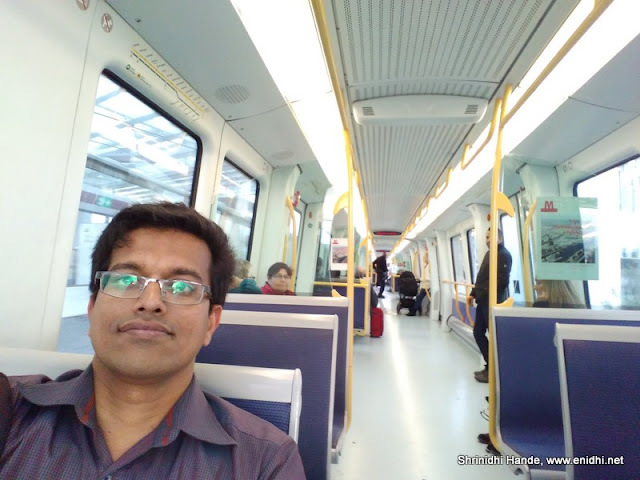 Over two months I spent there, about 3-4 days there were some disruption in metro system (not shut down, but some re-arrangements and delays). Local residents have a prepaid card system called Rejsekort. They would flash this card in and out against a sensor in all stations (or in buses) while entering and exiting- then system will deduct money accordingly. But short terms visitors or tourists can’t buy this card as it needs local address proof and has some processing time. I am not clear how it works if one day you are traveling with dog, other day with cycle, third day alone etc- you can't specify that while checking in.From what I observed, it is convenient but not necessarily very cheap. Other ticket holders do not have to check in/check out but show it to officials on demand. What happens if you are caught with wrong ticket? Usually you will be fined upto 750 DKK. If you have a valid ticket but you are in wrong zone, depending on official's mood you might get some concession if they believe it is genuine mistake. You might be asked to get down next station and buy a ticket, if you are lucky. It may be convenient to hail a taxi and reach your destination. But using public transportation will save you a lot of money. So spending some time & effort to understand a city's public transportation is certainly worth it.